As new technology, based on forbidden historic research, emerges, it quickly turns from hope for millions to a potential threat to billions. Famed rock-star-turned-philanthropist, Ashton Mink, is murdered in his Manhattan high-rise apartment, leaving behind the words “Devil’s Interval” as the only clue to the killer’s identify or motives. Dan Kotler, archeologist and consultant with the FBI’s new Historic Crimes Division, and Agent Roland Denzel, of the FBI, are called to the scene of Mink’s murder, and asked to help in the investigation. What they discover is a secret project, based on the research of historic figures such as Sir Isaac Newton, that could alter the course of history and enslave humanity. With the assistance of New York Police Detective, Peter Holden, Kotler and Denzel embark on another adventure, racing against the clock to solve Mink’s murder, recover stolen technology, and prevent an act of terrorism against all of humanity. The Next Sound You Hear Could Change Everything. 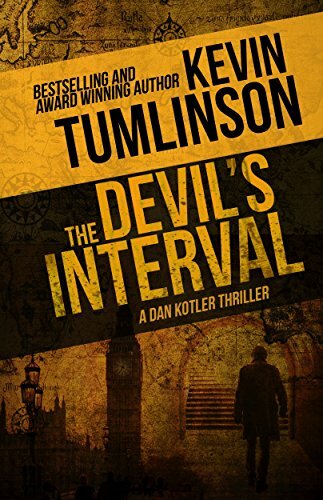 Read Devil’s Interval Now! There was a shot fired then, and Kotler watched Denzel leap sideways and take cover, then return fire. Kotler raced forward now, stooped low and angling toward the far wall, with the screen and Denzel to his right. From his new vantage point, he could now see into the workspace. Simon Patel was cringing on the other side of a large, wooden table, covering his head with both hands. Another man—no one Kotler recognized—had fallen back, pulling a large, rolling toolbox in front of him for cover. He was brazen about standing and firing at Denzel, who had only a thin wooden screen for protection. Denzel sprinted now, diving over a table and scattering its contents to the floor in a huge racket. From his vantage point, Kotler could see that Denzel still had line of site on the man, but it wasn’t a very strong position. There was little Kotler could do to help. He could see no way to skirt the edge of the room and get behind the shooter without being noticed. If he’d had a gun, he could easily have taken the guy out from this vantage point, at this distance. But despite being trained, licensed, and qualified on a variety of firearms, the FBI hadn’t yet granted him permission to carry, deeming it unnecessary for a consultant. Maybe this scenario would convince them. KevinTumlinson is a bestselling and award-winning thriller author, and host of the popular Wordslinger Podcast. He started writing stories at an early age, penning his first “book” at five years old—handwritten, on a Big Chief notebook. Tragically, the tale has been lost to history. At 12 years old, Kevin started his professional writing career, earning $10 per column as a writer for his local paper. Kevin covered “teen beat” topics and events, and received kudos from newspaper staff and the public for his crisp and affable style. After graduation, Kevin continued his work with newspapers and magazines, and eventually with online publications. Kevin shifted to copywriting in his twenties, and in his time in that profession he earned multiple awards and honors. His work was even recognized and praised by President Obama and his cabinet. Through copywriting, Kevin became involved in all forms of media, including film and television, and has worked with some of the largest and most well-known brands on the planet. In 2006, Kevin wrote his first full-length novel, and received a traditional contract. It was an exciting time, but the luster wore through quickly as Kevin discovered the limitations of the contract, in terms of royalties and rights. Kevin returned his advance for the contract, losing the rights to his book for four years, and all but decided to never try publishing again. In 2008, however, Kevin wrote and published the first of a science fiction series, and was gratified to see it succeed. Over the next decade, he published some forty novels, novellas, and non-fiction books, using his “30-Day Author” formula, and has fully embraced the indie author life. Today, his is the “Indie Author Advocate,” writing and publishing thrillers, producing podcasts, and representing aggregate publisher Draft2Digital, as the public face of the company.